NaMoCare - Gimmick or Revolution ? HomePoliticsNaMoCare - Gimmick or Revolution ? The NHPS has been hailed as a visionary scheme in some quarters. The 'health and wellness' centres to be set up across the country would offer primary health care services like maternal and child health services, mental health services, vaccinations against selected communicable diseases, and screening for hypertension, diabetes, and some cancers. 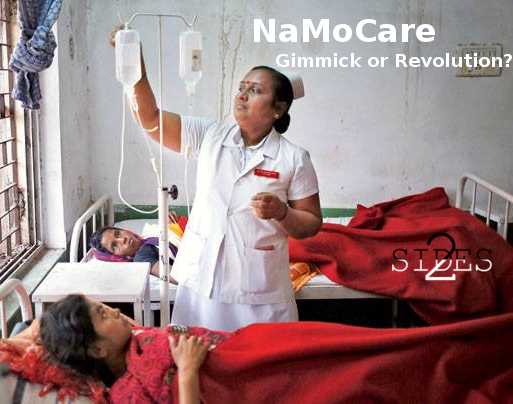 NaMoCare, on the other hand, will offer financial protection in case of hospitalisation in secondary and tertiary care. This insurance scheme, fully supported by the government and with no premium payment nor no co-payment by beneficiaries, will rescue the poor from catastrophic expenditure often encountered once a family member is sick and needs long-term health care. These announcements are nothing but good news for those who struggle for basic healthcare and often find themselves overcharged at private hospitals. NHPS aims to integrate Aadhaar and will be cashless. It has been at least two years in the making and the initial rollout is expected to happen by October 2 of this year. Further, it will be using the Socio-Economic Caste Census (SECC)data for enumeration of the poor. As opposed to the BPL(Below Poverty Line) criteria, which draws a clear line between those who benefit and those who do not based on household income, SECC uses exclusionary factors (for example, motorised vehicle) and inclusion criteria, such as households without shelter, manual scavengers, etc among others to count the people who would make it to the list. SECC will be a more accurate, efficient and up-to-date method as opposed to the currently used BPL for enumeration. Linking with Aadhar will also allow for following up on the services received and health outcomes achieved, thus allowing the programme to be monitored and evaluated on a real-time basis. The Modi-Jaitley budget also outlines plans to set up 24 new government medical colleges and hospitals, with at least 1 medical college for every 3 parliamentary constituencies and at least 1 government medical college in each state. It also contains tax incentives to encourage more middle-class families to take out private health insurance for longer terms. The various existing government healthcare schemes, like the Rashtriya Swasthya Bima Yojana (RSBY), will be subsumed in the NHPS scheme once it is launched. Secondary and tertiary healthcare have been given special focus in the budget as the cost of these services often tends to be far bigger and cause a much bigger stress on the poorer sections of the society. The long-term solution would be to improve public infrastructure to better standards(also outlined in the budget), but the insurance scheme like NHPS would provide a more immediate solution to the high out-of-pocket expenses for these services incurred by the poor. The NHPS thus is an intervention that will provide relief to its 50 crore beneficiaries by taking over the burden of these services. The government expects the scheme to cost Rs 10,000 crore, at an average premium of Rs.1200 per family benefitted. This cost is split between the central and state governments in a 60:40 ratio. The government has provided an outlay of Rs. 2,000 crore for the scheme in 2018-19 and the Rs. 5,000 crore in central government funding on top of the Rs 2,000 crore allocated in the budget would be made available as the scheme details are worked out. The government expects the cost to be covered by a new ‘health and education’ cess of four percent on personal income and corporation tax which will replace the existing three percent education cess. The additional 1% cess will fetch Rs. 11,000 crore, which will be utilised for implementing NHPS. In short, NaMoCare holds promise to be a landmark healthcare reform in India which could help the country move towards universal health coverage and equitable access to healthcare. It is an effective step towards achieving this goal, which is one of United Nations Sustainable Development Goals (UN-SDG). The scheme has attracted much scrutiny over its financing. Being the final budget before the 2019 elections, NHPS has also been called by some sectors as a populist gimmick meant to help no one but the private health care providers. Both the prospects and rationale of NHPS has been met with much cynicism. A Business Standard poll found that 57% of respondents on Twitter and 68% of respondents on Facebook and did not think the scheme would succeed. The Centre’s estimates of how much the scheme will cost have also been questioned. CNN reports that ‘if the program is fully taken up, it would cost close to $780 billion.’ The current estimate of Rs 1,200 per household has been called ‘grossly insufficient.’ Assuming full-scale implementation and claims, 5lakhs for 10 crore families would accrue a net cost of Rs. 50 lakh crore to be borne by the private insurance sector. In comparison, India's current GDP is around Rs. 150 lakh crore. Some critics have also pointed out the failings and lack of implementation of the RSBY among other such government schemes. The RSBY, a UPA government initiative launched in 2008 with an insurance cover of Rs.30,000 per family, had targeted 5.9 crore families and managed to enrol 3.6 crore families. It has been plagued with problems of transparency and inefficiency. A study published last year said a combination of ‘low enrolment, inadequate insurance cover and the lack of coverage for outpatient costs’ meant the RSBY failed to bring down out-of-pocket expenditure among those it targeted. Critics have also been quick to point out that the same Modi government and the same finance minister had, in their very first Budget in 2014, slashed health expenditure by around 20% and that the schemes inherited by the Modi government – such as the National Health Mission – have had their budgets cut. The NHPS announced in the 2017-18 budget, a modest form of the current version aiming to provide Rs. 1Lakh cover per family, had not taken off. The government told the parliament just two months ago that the scheme was yet to be finalised. Thus the hike of the coverage from 1 to 5 lakhs in the current budget seems but a cosmetic measure. The Rs.1,200 crore the finance minister has budgeted for setting up the 1.5 lakh “health and wellness centres” mentioned in his speech comes to around Rs 80,000 per centre. In the absence of a strong supportive infrastructure, this amount will only help in marginal improvements in the primary healthcare sector. Further, NHPS will not be able to fix the public healthcare system in India as it offers support only for clinical services such as hospitalisation and surgery. Outpatient clinics, which accounts for a lions share in an average household's medical bills, do not come under the ambit of NHPS. Several states like Kerala, Tamil Nadu, Andhra Pradesh, Telangana, Madhya Pradesh, Chhattisgarh and Rajasthan already have their own functioning health insurance schemes for the masses. In fact, Chief Minister Mamata Banerjee of West Bengal has already announced her decision to opt out of the ‘Modicare’ scheme as she claims more than 50 lakhs citizens of the state have already been covered by its own insurance program. Similar voices are also being heard from Karnataka. Another critical aspect of NHPS implementation would be changing the role of the state from being a service provider to being a financier of healthcare. Without an adequate system of health infrastructure in place, such a transition will only help private players to get fatter feeding off public wealth without enhancing welfare or social gain. Shifting the focus away from poorly developed primary healthcare to super speciality tertiary care will only clog secondary and tertiary public hospitals with diseases preventable or treatable at lower levels of health services. The budget thus reflects a flawed approach towards the health needs of a majority of Indians. A better idea would have been to increase the spending on health infrastructure in the country, which remains woefully low. Even countries like Bhutan and Ethiopia spend significantly more percentage of their GDP than India on healthcare. Alas, with an eye on the upcoming elections, the government seems to have failed to keep healthcare and half-baked populism separate.